Are you looking for a vehicle that is affordable and small and also powerful? 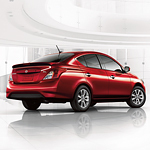 The popular subcompact sedan from Nissan, the Versa Sedan, is everything that you are seeking. The performance features that are part of this vehicle will impress you and make you excited to get into it and drive it. When you press on the gas in your new car, you want that car to take off. You want to find a car with an engine that does not hesitate. The powerful engine that is part of the Nissan Versa Sedan will get you moving quickly and will help you accelerate well. The transmission of a vehicle affects the way that it performs and you have to decide if you want a manual transmission in place in your new car or if you would rather go with a CVT transmission. The Nissan Versa Sedan gives you the option to choose between those two transmission types.